A new documentary by award-winning William Paterson University sociology professor Vincent Parrillo explores the city’s ethnic and demographic history from pre-European times to today. The documentary “Paterson and its People” hearkens back to pre-European times when the Native-American Lenape tribe roamed the land that would later become the Silk City and welcome thousands of immigrants from the Old World. Parrillo said the documentary then shifts its attention to the early arrivers like the English, the Scots, the Irish, the Germans, the Italians, the French, and the Jews as well as the late arrivers like the Blacks, Hispanics, and Muslims. There’s also the Poles, the Russians, the Dutch, the Swiss, and many other groups who migrated to the city. “The diversity of America is found in the city of Paterson,” said Parrillo. He shared the story of the Middle Easterner – Arabs and Turks — who arrived in the city during the early part of the 20th century. “During the time of the Ottoman Empire, pre-World War I, you had a lot of Syrians and Lebanese who came here,” he said. Those two groups settled in the South Paterson neighborhood which opened the door for other immigrants from the Middle East. During the 1913 Paterson silk strike, a lot of the mill owners sent labor agents to Ellis Island to recruit newly arrived immigrants for the city’s booming silk mills, said Parrillo. Those agents recruited Syrians and Lebanese who were fleeing the decaying Ottoman Empire for the United States. Parrillo’s 55-minute documentary highlights some of the city’s famous residents and visitors with a microscopic focus on ordinary Patersonians who lived and worked in the city. Interviews, historic photographs, and on-location footage at various city locations tells the story of Paterson’s demographic evolution. Parrillo said he worked with the Paterson Museum, the Passaic County Historical Society, and the North Jersey Jewish Historical Society. Passaic County historian Edward Smyk served as a consultant for the documentary which was completed after a year-and-half of work. Parrillo served as the author, narrator, and co-producer of the film with Jaroslaw Ziaja who served as the editor. As he worked on the documentary for more than a year, he found several surprises including the presence of more than 3,000 Lenape Indians who continue to dwell in the greater Paterson area. “I was surprised at the strong presence at one time of the French and Swiss neighborhoods in Paterson,” said Parrillo, who was born and raised in the Silk City. He mentioned the Swiss who would hang large banners on Main Street in anticipation of their annual parade. He mentioned the French who occupied the city’s Stoney Road neighborhood. The professor said the documentary features maps of the city showing the different sections that were settled by different ethnic groups. The Dublin district, he said, was home to the largest number of Irish. “People came, they made their mark, and moved on,” said Parrillo. As one group moved on another moved in, he said. The story of those groups that moved on and those that have moved in is the focus of the documentary shot on a “shoe string budget” with funding from the William Paterson University Alumni Association. The documentary will be screened on Wednesday, September 30th, 2015 at 5:30 p.m. in the Shea Center for Performing Arts at William Paterson University. Prior to the screening the documentary will air on NJTV on Saturday, September 26th, 2015 at 1 p.m.
Parrillo is the producer and writer of three award-winning PBS documentaries: Gaetano Federici: The Sculptor Laureate of Paterson (2013); Smokestacks and Steeples: A Portrait of Paterson (1992) and Ellis Island: Gateway to America (1991). “This film was a labor of love,” said Parrillo, who now resides in Ridgewood, about his latest documentary. 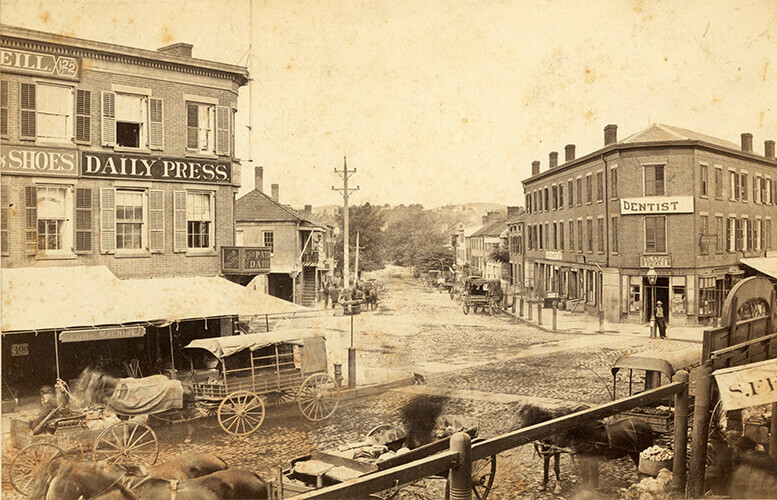 Photo caption: Circa 1870, three-way intersection of Main Street, Broadway, and West Broadway (formerly known as West Street).